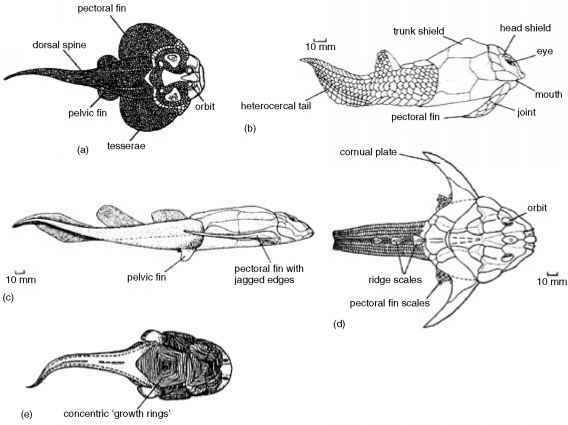 The first chondrichthyans ('cartilaginous fishes'), distant ancestors of modern sharks and rays, may be indicated by isolated scales and teeth from the Upper Ordovician and Silurian (Sansom et al., 2001). The first definitive remains containing prismatic calcified cartilage (see below) date from the Early Devonian. An early shark, Cladoselache from the Upper Devonian of Ohio (Figure 3.15), reached a length of 2m. The skin does not seem to have borne scales, although small multicusped tooth-like scales have been found on the edges of the fins, in the mouth cavity, and around the eye. 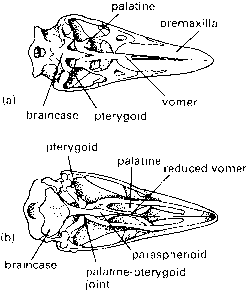 known also in placoderms and several agnathans, but chondrichthyans appear to be unique in having prismatic calcified cartilage, arranged as small platelets or prisms. Cladoselache is usually assigned to the order Cla-doselachida, a group restricted to the Late Devonian. Other shark remains are known from rocks of this age (Zangerl, 1981), but none as well as Cladoselache. The major chondrichthyan lineages arose in the Devonian, but radiated in the subsequent Carboniferous Period, so this later history is discussed in more detail in Chapter 7.